Boy-Kuripot Certification ~ Philippine Freebies, Promos, Contests and MORE! Running a promo, contest or freebie? Well Boy-Kuripot is here to help you craft your mechanics that may help you run your contest or promo smoothly and at the same time give confidence to people to join. Apply for a Boy-Kuripot Certification. Bloggers, brands/companies, or agencies are welcomed to use the Boy-Kuripot Certified badge below PROVIDED you conform to the rules/guidelines set below. This is a FREE service. I want to take this opportunity to thank all of you who contributed in drafting the guideline. The dictionary defines the word “free” as “provided without, or not subject to, a charge or payment: free parking; a free sample.” Free should therefore mean that a customer should get something, be it an physical or virtual product or service, without paying or doing anything that requires difficult work. This definition however should not be confused in interpretation of another context. For instance, on the FREE ONLINE PROMOS links, the word “free” pertains to the investment you are to provide before joining. The dictionary defines the word “contest” as “a formal game or match in which two or more people, teams, etc, compete and attempt to win.” Contest therefore require certain amount of skill and time investment in order to participate. More often than not, the judging criteria is present. Purchase of a product or service. Entries that require products to be visible or used shall be required to clearly indicate it. For photo, video and writing contests, intellectual property must remain with all participants. Contest holder can have the right to usage of the creative property only for the winning entries. Winners MUST be contacted through at least one of the personal channels such as SMS, email, or social website private or public message. If you think your promo or contest adheres to all the guidelines laid out, you may fill up the form below so that I may screen you before allowing to use the Boy-Kuripot Badge. You may embed the Boy-Kuripot Badge on your banner design or simply link it to your post with a text saying “This is a Boy-Kuripot Certified contest/promo”. I will be providing all logos and badges you may use for your collateral in my email reply. In exchange, I have to make it a mandatory rule to link back to http://boy-kuripot.com/ every time the badge is used. 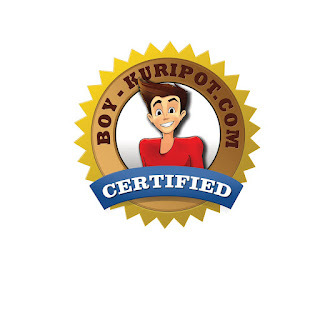 All promos and contest using the Boy-Kuripot Certification Badge will have the same badge indication through either a blog post or the FREE ONLINE PROMOS section.